Home > 2019 > 03/20 > Vancouver Canucks vs Ottawa Senators Post-Game Recap: Ottawhat Was That? Both the Vancouver Canucks and Ottawa Senators entered the night on two-game win streaks—much to the chagrin of those fans on each franchise’s respective Teams Tank. One squad would be leaving Rogers Arena with a three-game win streak in hand and bragging rights about not being the worst team in Canada—and that was all the motivation that players on either side would need, lottery odds be damned. Still, there was more than pride on the line. The recent victories had put the playoffs back in sight—albeit distant—for the Canucks once again, and they entered Wednesday’s contest just six points back of the last wildcard spot in the west. In other words, this matchup with the lowly Senators represented a game that Vancouver could not afford to lose—but also the exact kind of game that they frequently do. Anders Nilsson—who would start the game opposite Jacob Markstrom—had a little extra motivation on his side, too, as he faced off with his former employers for the first time since being dealt. The Canucks nearly jumped to an early lead less than three minutes in, courtesy of the new second line of Tanner Pearson, Bo Horvat, and Loui Eriksson. Though this would have represented a markedly better start than in the last few outings, Anders Nilsson was able to turn away multiple chances from his former teammates in quick succession. The game then settled into a period of play that could be generously described as “uneventful.” Solid defensive positioning by defenders like Alex Biega kept the Senators to just five shots against by the second TV timeout, but the Canuck forwards also struggled to earn any chances of note against Nilsson. Action picked up when Jake Virtanen drew a holding penalty on Cody Ceci, sending Vancouver to their first powerplay of the game. After going one-for-one on the man advantage against Chicago, the Canucks PP got right back to work—earning several marquee chances in the first 30 seconds of the powerplay. The seemingly endless barrage of offense from the top unit culminated in a play in which every member contributed. Brock Boeser rocketed a shot on net, then Pettersson picked up the rebound and set up an Alex Edler point shot that was deftly tipped in by Bo Horvat—all the while Josh Leivo provided an effective screen in front of Nilsson. Pettersson picked up a secondary assist to extend his lead on Pavel Bure. The Canucks were up 1-0, and the once-flagging powerplay was now officially on fire. The period ended with the Canucks doubling the Senators on the shot-clock—to the tune of 14-7—and ahead by a goal. Hearing the Sportsnet panel debate whether Elias Pettersson’s rookie season is more impressive than Pavel Bure’s or not—and having it be a legitimate discussion. What a ride it has been. The second frame opened up with perhaps the strangest goal of the Canucks’ season thus far. After Alex Biega sent a high dump into the Senators’ zone, Tanner Pearson let it bounce once before expertly batting it past Anders Nilsson. It was an impressive display of hand-eye coordination and, just 32 seconds into the period, Vancouver was already ahead 2-0—on a play that nobody could have planned for. Nobody, that is, except Alex Biega—friend of the blog and underrated hockey genius. The good times kept rolling a few minutes later, with Jay Beagle sending Jake Virtanen and Tim Schaller on a two-on-one—and Virtanen not even briefly considering the pass. Barely taking the time to glance over at Schaller, Shotgun Jake bore down and buried a wrister past Nilsson—wetting palates province-wide and moving the Canucks into a commanding 3-0 lead. Confusion erupted at the Ottawa net the next time Beagle’s line hit the ice, and the Canucks’ fourth line combined to put another puck past Nilsson with a series of frantic—though the ref ruled it “no goal” on the grounds that Nilsson had been pushed into his net. Travis Green chose not to press the issue after having an entire TV timeout to consider it. Virtanen drew the ire of the Senators toward the end of the period by crunching Zack Smith from behind, setting off a scrum—but somehow avoiding a penalty. The next shift, JG Pageau looked for revenge by hitting Ashton Sautner in the numbers and headfirst into the glass—but this time the ref made the correct call. Sautner would eventually be removed for concussion protocol, only to return later none the worse for wear. The suddenly-deadly Canucks powerplay picked up where it left off. Elias Pettersson dug the puck off the boards and fed it back to Alex Edler—who then smoothly passed it over to Brock Boeser, posted on the right point. Taking advantage of being far from his usual spot, Boeser walked in toward Nilsson and lasered one right past him—extending his personal point streak to eight games and the Canucks’ lead to 4-0. As the middle frame expired, Ottawa was starting to become testy—and it was easy to understand why. 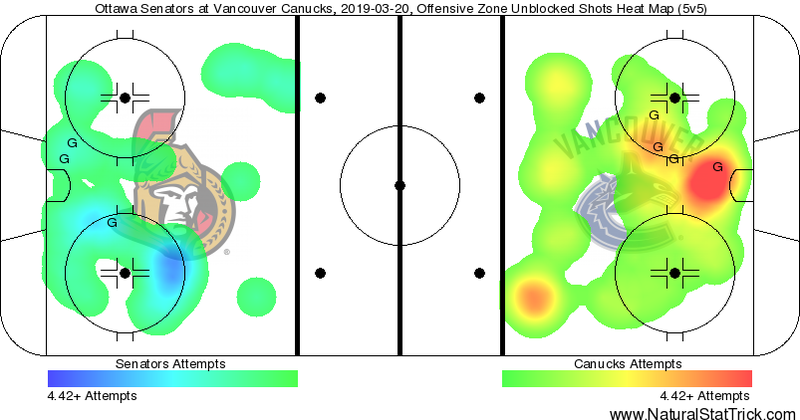 In addition to the lead on the scoreboard, the Canucks also dominated the shot-clock by a margin of 33-13—and the Senators had yet to be awarded a powerplay. Vancouver liked their start in the second so much, they decided to replicate it in the third. Less than a minute into the frame, a Bo Horvat forecheck led to Loui Eriksson intercepting a clearing attempt at the line. Eriksson fed it back to Horvat, who relayed it to a net-side Tanner Pearson—and Pearson made no mistake in tapping the puck into the yawning cage. The Canucks moved ahead 5-0, and showed no signs of letting up anytime soon. After getting away with some nasty crosschecks to Elias Pettersson’s back the shift before, Brady Tkachuk was sent to the box for interference—granting the Canucks an opportunity to go three-for-three on the powerplay. This time, the second unit came out to start—and although they earned a couple shots on net, they didn’t look nearly as effective as the top squad. They also gave up a two-on-one shorthanded that very nearly cost Jacob Markstrom his shutout—and so Pettersson and pals hopped onto the ice before more damage could be done. They were also unable to score. Markstrom’s shutout wasn’t long for this world, anyway. The newly-signed Max Veronneau was waiting patiently at the net-side to tip a Dylan DeMelo pass up and over Markstrom—scoring his first NHL goal in the process and narrowing the Canucks’ lead to 5-1. As the period reached its halfway point, Tkachuk took advantage of some spotty coverage—and a brilliant backhand pass by JG Pageau—to cut the lead further, tapping the puck past an unsuspecting Markstrom. With the score now at 5-2, the Canucks were still in command of the game—but Vancouver fans were not without reason to worry. Those fears began to come true with just over six minutes left, as Markstrom mishandled a dump-in—which allowed the Senators to set-up an Oscar Lindberg snapshot from in close that Markstrom was unable to deny. As the scoreboard flipped to 5-3, it was starting to look like the Canucks might end up the victims of the sort of comeback effort they’d become so fond of themselves in recent games. To make things even more interesting, Tyler Motte took a slashing penalty with 3:45 remaining, granting the Senators their first powerplay opportunity of the game—and a golden opportunity to move to within one. And that’s exactly what they would do. With just under two minutes remaining in the game, Anthony Duclair snuck a shot through the crowd in front of Markstrom from the top of the circle. Markstrom got a glove on it, but the puck trickled into the net anyway—turning the score to 5-4 in favour of the Canucks and the momentum decidedly in favour of the plucky Senators. Fortunately, that was the limit of the Canucks’ “fall-from-ahead” efforts in this one. With just over a minute left on the clock, Bo Horvat won a draw back to the point and went straight to the front of the net to tip in an Alex Edler shot. It was the duo’s second collaborative effort of the game—making the score 6-4 and preventing the Senators from making what would have been considered an embarrassing comeback. Loui Eriksson picked up the assist on Horvat’s goal, his third point of the night, and he made it four on the very next shift—lobbing a long bomb from his own end into the Senators’ empty net. With the seventh goal of the final frame—and the score now at 7-4—the teams agreed to call it a night. Was this a good game for the Canucks? It’s difficult to say. On the whole, Vancouver extended their win streak to three games and moved to within four points of a wildcard spot in the Western Conference. The Canucks really couldn’t afford to lose this game—and they didn’t! So, that’s a positive. On a more micro level, the Canucks also gave up four straight goals in the third period to nearly squander a 5-0 lead—and they did so against the worst team in the NHL. Though Vancouver may have technically put themselves back into the playoff race with this victory, they also solidified the fact that they’re not still not a true playoff contender. All in all, it was a fun game—but it’s hard to call this anything but a discouraging performance from the Canucks. Four points on the night gets Eriksson on this list automatically, but don’t be fooled by the fact that all three of Eriksson’s assists were secondary. Eriksson consistently made smart plays at both ends of the ice in this game, and his play seemed to perfectly compliment Horvat’s. It’s too little, too late to salvage the season for Eriksson, but this sort of performance is still welcome from the $6 million man. If Horvat isn’t wearing a “C” on his chest next season, Vancouver fans should…engage in mild civil unrest. It’s becoming more and more apparent that Horvat is capable of putting this team on his back whenever the situation calls for it—and his two goal, one assist performance in this must-win game is another perfect example of his clutch-ness. Edler was once again all over the scoresheet, notching three assists, a plus-three rating, two hits, and two blocks. While his 26:12 of icetime is actually on the low side for him, Edler was incredibly effective at both ends tonight. He’s practically carrying the blueline single-handedly at this point—and he’s looking great while doing it. The Canucks will enjoy a couple of off-days at home before heading back to Rogers Arena on Saturday, March 23 for a matchup with the Calgary Flames. The start-time is 7:00PM PST and the game will be broadcast on both CBC and Sportsnet Pacific. What was that? A young team supported by veterans coming up big in March. Edler was drafted a Canuck in 2004 and has been a defensive backbone of this team for years now. Bo was 9 years old when Eddy was drafted as a Canuck. If he signs an extension I would like to see Eddy wear the ‘C’. Tell us, how is that workin out for ya, troll? Pearson got an assist on Loui’s empty netter too, SN didn’t put that up in the three stars. Yeah, what was all that about Goldy!? I thought he was making good strides in his 200ft game this year, is he gone now? Do they know something I dont!? Interesting to consider, but obviously would never (or even perhaps should happen), but I wonder what you could get for Markstrom in a trade? He could be a huge difference-maker on a team with all the pieces but crappy goaltending, interesting theoretical consideration, I bet he would be worth a lot, but then we would be left in big trouble, unless we sign a good ufa, or Ian Clark works his magic on Demko too. I think the goalie market is a bit saturated at the moment, so it might not be the best time to cash in on Markstrom. I’d hang on to him for at least another season–and sign him to an extension ASAP. Hey Rodeo! Markstrom is the clear #1 for this team. They should be planning to re-sign him for a three year extension. Factoring-in where he’s at in his career, potential injuries at the position, and the roadmap of the development of the backup, it seems a no-brainer. Two excellent goalies on the team is exactly the position the Canucks want to be in while working to develop and upgrade their d-corps. The advantages of keeping Markstrom far outweigh whatever return you’re going to get. Plus, with the playoffs a realistic goal for next year, Markstrom has the experience and fire I want in net. Let’s let Demko take the net from Markstrom as Markstrom did with Nilsson. I completely agree and don’t think we should trade him at all, He has arguably been our best player all year. I was just wondering in a theoretical sense what value he might have. A fine 41 minutes of hockey. Someone must have said the S word. Not a Loui fan, but he gets a couple secondary assists and the CA blogger says he’s garbage, but Petey gets two secondary assists and he gets a highlight reel standing ovation? A secondary assist either counts for something or it doesn’t — be consistent. And WTF with this team? You know Edler is going to get an NMC on his extension and it looks like the Canucks will be out of the playoffs and out of contention for a lottery pick. I would be fine with an NMC if it’s no more than two years in duration. That way the Canucks would not have to protect Edler in the expansion draft. But criticizing the Canuck for something they might do is a little silly. Every team not making the playoffs is in contention for the lottery pick. Not sure why CA writers need to find a whipping boy yes Loui has a big contract and was signed to score but hasn’t delivered on that. He has been doing everything else except for scoring and true not worth the money he is being paid. Perhaps Bo has found two wingers who he can play with they can drive the play as well as defend. Lets see if they can carry this on through the rest of the year if they can who knows what is in store for next year. If Loui can redeem himself on this new line would be a good outcome. Trading him bbecause of his contract would cost more as it would have to include a prospect to go with him and the return would be garbage because the other team was doing you a favour. I would keep him as well as Sutter and if Loui finds his offensive play again with his new line mates all the better. But Canucks were playing Ottawa, lets see how the Calgary game turns out and if they pull off another victory we will then take it one game at a time and see where it goes who knows what may happen. Sign Edler to a good two year NMC and if he still has mileage after that sign him year by year with more NMC this would get him by the next expansion draft. He means a lot to the Canucks and with a new defense coming in he and Tanev can help ease the new prospects into the lineup. Yes they have been injury prone but when they are out of the lineup that still gives the prospects room to grow. Not sure I am reading this correctly, are you saying Loui drives play? I think Loui has always been a 3rd wheel, throughout his career. I won’t miss him, when he is gone. If he can redeem himself he could be more valuable to the Canucks by keeping him. He can make good plays as well as kill penalties. Mostly what I am saying is lets not move him because it would cost us more than it would keeping him. Costing more I think we would have to make it enticing by sweetening the pot with a prospect to have another team take his contract off the Canucks books plus we would get an anchor or dead weight back from the other team and I don’t believe anyone will take him anyways. Nt sure if he can drive play but he has in the past been a good garbage man knocking in someone else’s rebound as he did before coming to Vancouver. At this point I’m indifferent with Loui. His salary won’t cause cap issues until Petey and Quinn’s ELC’s are done. My preference would be to see him get moved to the minors next year to open up a spot for someone more deserving. Perhaps he gives us some better winger depth next year when injuries hit. Of course this only happens if a prospect or one of the other mid to low range wingers we have can push him off the roster. Agreed on the consistency issue but the standing ‘O’ was given for Pettersson’s breaking of Pavel’s rookie scoring record. @Dirty30 . .. re: Louie. Imagine if it was (“Ultra-skilled”) Goldobin that made the initial pass to Bo on Pearson’s second goal. It would have been referred to as incredibly high hockey IQ offensive genius. With Baertschi off IR, looks like Goldy only has to be better than Pearson, and Lievo, and Baertschi, and Granlund …… not too promising since all have more goals than he does (yes, including Baertschi). There is most definitely no Team Tank in Ottawa, what with their 1st pick in the hands of the Avalanche. Don’t forget about the #MelnykOut movement! There’s a vocal portion of the fanbase that wants to see them bottom out, draft pick or no! I live in Ottawa and I’m don’t think that’s true. The Fire Melnyk bit, absolutely, but I don’t see how they’re connected. Once the Seattle expansion fees are paid, I think Melnyk sells. Sure is nice to see the Canucks ahead of the Oilers in the standings. There is a big temptation to look for signing some pretty high free agents. Canucks may have the cap space but need to look at the future. Oilers had a great playoffs last they had made them and then they went out and signed some pretty big conntracts including some of their young stars and free agents. Then they just started crapping the bed. Canucks need to learn from this. They are starting to develop a good young core who will be up for significant pay hikes. Now we need to build around these young guys without breaking the bank. Don’t need to spend up to the cap, they have a couple large contracts that will start coming due after a couple more seasons namely Sutter and Loui. If we keep them they have not been a cancer sure their contracts are rich but they have added to chemistry and are not a drag on the team, sure they aren’t scoring but they kill penalties and have played a good defensive game. If they are traded it will save some money but won’t add to the lineup. Stay the course don’t sign any free agents except for depth players that know if they don’t make the lineup they will play in Utica. This is CA – astute hockey knowledge and sense isn’t necessarily appreciated here…… I agree with everything you say. If you think the fire Benning crowd is okay with that. You’re wrong. Glad to see Boeser on a tear, and Horvat building on a career-best season. Not so glad to see the Canucks climbing the standings by winning meaningless games. I hope they can drop down to #6 by the end of the season, so they have a realistic shot at Byram, and a better shot in the draft lottery. Some fans see the games as meaningless but the players don’t. Did the lottery simulator and the Canucks won it all!! Not touching the simulator til next year. Come on lucky lottery balls!! Canucks have lost a lot of games after leading by two periods. Almost did it again. Coach Green better get his s*#t together. I was at the game, couldn’t disagree more about it being a “discouraging” performance. They absolutely dominated Ottawa for the majority of the game. It wasn’t until the 3rd when Markstrom let in some soft goals and a few guys took their feet off the gas. Cant remember the last time the Canucks scored 7 goals in a game, not sure how that could be considered discouraging…Especially so when were missing Hutton and Tanev. On a side note, I thought Schenn looked pretty good tonight. Decent skater, doesn’t hold the puck too long and is physical. Same goes for Sautner. Pretty decent depth pairing all in all. Averaging close to two minutes more of ice time with his new team, Gudbranson has played 11 games since joining Pittsburgh and is plus 5 with the Penguins after being minus 27 with the Canucks. Gudbranson is a player suited to a playoff bound team. It allows him to play a simple and aggressive game. For where the Canucks are in their cycle, he was a bad fit. It clearly demonstrates Benning really did think this was a quick turnaround. “No, i’m not a flip flopping little bi*#h like you kooty. In answer to the headline, that was a sloppy game by two non-playoff teams who also aren’t going to win the lottery. So enjoy the ride! At this point it looks like Pearson is probably going to be a better vet to have on the team than Gagner, Gudbranson, or Sutter so that’s a positive (I definitely think Gaudette should replace Sutter long term). Also nice to see that little pos Pageau is getting an in-person hearing for the cheap shot on Sautner. I can’t stand him.